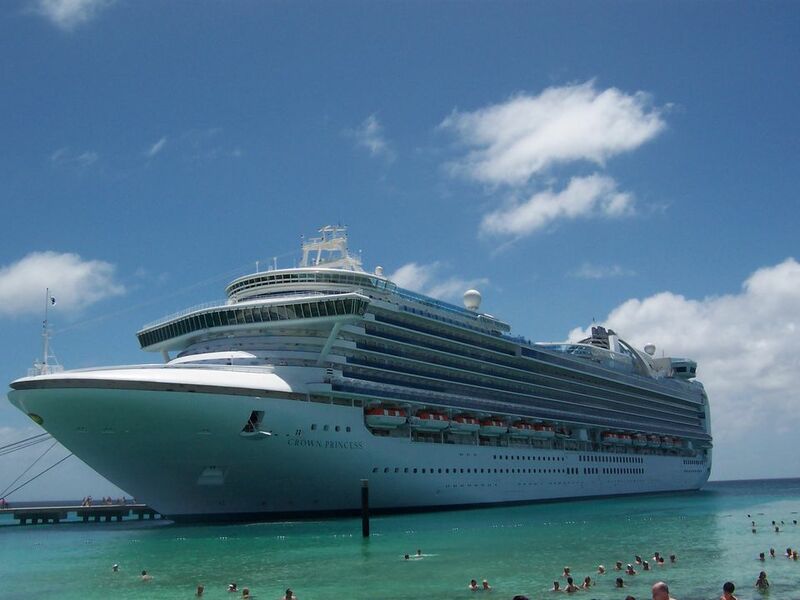 The Crown Princess cruise ship currently sails to Mexico in the winter, and Alaska in the summer. The ship looks similar to her sister ships the Golden Princess, Grand Princess, and Star Princess, but she has the most in common with the Caribbean Princess, Emerald Princess, and Ruby Princess, including the ability to accommodate 500 more passengers than the other three siblings. An additional deck of cabins increases the passenger capacity, but the common areas are the same size. Those who have sailed on the Golden, Grand, or Star Princess will notice the extra sailing companions. However, the ship is still a beautiful sailing resort, with plenty of activities for travelers of all ages. The Crown Princess has six different types of staterooms, ranging from a 591-square-foot luxurious owner's suite to a 160-square-foot interior double cabin with no view. Pricing depends on size and location--higher decks and mid-ship staterooms are usually more expensive. All cabins include a bath with shower, television, refrigerator, and hairdryer, and suites have both a bathtub and a shower. About 80 percent of the outside cabins have balconies, but some of the balconies can be seen from other cabins on higher decks or public areas of the ship, so they can't really be described as completely private. The Crown Princess features Personal Choice dining, meaning that passengers can choose either "traditional" fixed-time, fixed-table seating in the Michelangelo Dining Room or "anytime" dining in the Botticelli Dining Room and Da Vinci Dining Room. The Crown Princess also has two specialty restaurants with a cover charge -- Sabatini’s (Italian trattoria) and the Crown Grill (steak & seafood). The Crown Princess also has numerous casual dining venues, including a 24-hour Horizon Court buffet. The Crown Princess' show lounge is the Princess Theater, which features Las Vegas-style entertainment from the resident troupe. The "Movies Under the Stars" outdoor movie screen near the pool spans 300 square feet and is used for first-run movies and major sporting events. It's almost like being at a drive-in theater! Club Fusion and the Explorers Lounge feature cabaret acts, dancing, and other entertainment. The Crown Princess also has several other smaller lounges, some of which have live music. Many cruise lovers enjoy the Wheelhouse Bar since its wood paneling and ship memorabilia gives it the look and feel of a classic ship. For those who like to gamble, the Crown Princess has the Gatsby's Casino, with all sorts of gaming tables and over 260 slot machines. Cigar aficionados will appreciate the cigar lounge next to the casino. The Crown Princess has three swimming pools and several hot tubs. The Lotus Spa includes all the traditional treatments, and the fitness center features the latest high-tech equipment accompanied by great ocean views. One intriguing feature on the Crown Princess is the extra surcharge Sanctuary, an adults-only, outdoor spa-inspired setting with signature beverages, light meals, massages, attentive service and relaxing personal entertainment. The Sanctuary is found forward on the top deck of the ship, so offers a quiet place for adult relaxation.